If you are a bargain shopper, looking for wholesale maternity clothes may seem like a logical solution to the dilemma of creating a short-term maternity wardrobe. When a maternity store purchases clothes from a wholesaler or manufacturer, they do it at a greatly discounted price. Often the price a consumer pays for maternity clothes is three to ten times what the retailer paid to the wholesaler. This markup pays for such costs as sales help, store rental, utilities, advertising, and profit. 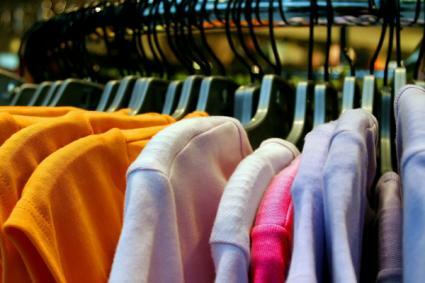 In order to offer retailers the best prices, wholesalers only sell their clothes in bulk. This means you might have to buy a dozen red sweaters in the same style to get a bargain buy. Due to state sales tax collection requirements, wholesalers will only sale to businesses that have a valid sales tax identification number. Wholesalers may have a minimum purchase amount set that is cost prohibitive. Because the cost of packing and shipping small lots of clothes may substantially change the pricing structure a wholesaler can offer a retailer, the wholesaler may require you purchase from several hundred to several thousand dollars worth of goods at one time. Not only is the cost of shipping an order of this size significant, you could be looking at spending more in total on a wholesale order than you would have if you had purchased a few select items at a retail shop. Many manufacturers are open to the public on specific days, so if you are located near a maternity clothes manufacturer, you may be able to pick up some great buys when the floor is open to consumers. Pool your resources with other pregnant women, then obtain a state sales tax identification number. You can place a large order with a wholesaler, then divide the items up with the pool members. Remember, the state will expect you to pay sales tax on all items purchased for personal use. Buy in bulk, then resale what you do not need via online auctions. In most cases, if the buyer is not located in the same state where you reside, you will not be required to collect sales tax; however, you will incur auction fees that will need to offset against your profits, and shipping can be time comsuming. An alert buyer can sometimes find maternity clothes at wholesale prices through retailers. This happens most often at the end of seasons and at year-end, when retailers are trying to reduce inventories. The drawback is the maternity clothes selection may be limited and are often made up of returns or clothes no one else would buy. If you have eclectic tastes, you may find a treasure trove of bargains, but if you are looking for classical style, you may be disappointed. Also, be on the lookout for factory seconds that are advertised at wholesale maternity clothes prices. Factory seconds are clothes that are flawed in some way. Many times these flaws are so minor that no one will notice, but if you purchase a blouse with one sleeve longer than the other, then your "deal" is not a bargain.